Let’s say you have a workplace or school memo that you want your co-workers/employees or students to take the time to read? You can, of course, send the memo through email, but you also want your audience to be able to see that memo as often as possible. One way to achieve that is to post that memo on a presentation board that will attract your audience’s attention every single time they pass by it. We have the ideal fabric display board that you can use for this purpose. This fabric display board package is intended for use in offices, libraries, schools and universities. They are meant to serve as presentation boards where you can pin up posters, memoranda, and other materials printed on A4-sized paper. This presentation board is meant to ensure that all your announcements will be broadcast properly to your intended audience. If you need more exposure for your memos and posters, you can opt for double-sided printing for the fabric panels, especially when you’re planning to place them where they will have 360-degree visibility. You would notice, if you have been going through our website, that this package may look the same as the inclusions of Package 2. However, the graphic panels on the displays of Package 2 are laminated. The panels on this package, on the other hand, are made with fabrics of solid colours. Why should you buy this presentation board package? There are a number of reasons why you should invest on this deal. One big advantage you will get is the attractiveness of this display board system. The fabric panels on the pop-up display are carpet-like for adhesiveness, perfect for sticking documents on it. These panels are available in solid blue, gray and white. On the other hand, the graphics of the fabric on the pull-up banners in this package are printed using the best and the latest in fabric printing technologies. They look professional, with their vivid colours, clear details and the polished finish on their sturdy aluminium frames. Speaking of aluminium frames, you can rest assured that they are safe and stable. They will not topple with the slightest movement. That’s because the elements of the frame lock into place. Setting up these displays is a breeze, too. You only need 2 to 3 minutes tops to assemble each piece. So you will not waste more time and manpower than is necessary in putting up these presentation boards. If you need to transport them to another place, you can do it without a fuss. These displays are highly portable, and they come with their own carry cases. The carry case for the pop-up wall even doubles as the counter. Do you have a limited space in which to put these displays? Again, not to worry – you can easily adjust the displays by adding to or subtracting from them as necessary. You can be flexible when it comes to setting up your presentation boards. And lastly, but certainly not the least, you will save a lot of money when you avail of this deal. Not only does this package already come at a discounted price, you will also get a lot of use for it. They are, for one, resistant to damage and fading. 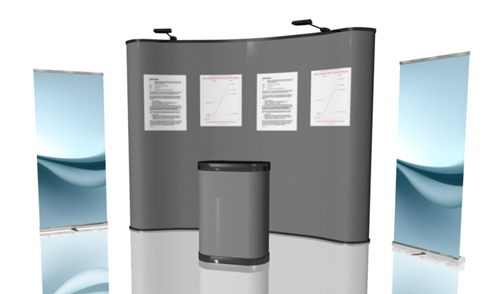 If ever you’re going to participate in an exhibit or expo, you can use these displays. And if you do need new displays, you don’t have to order a brand-new set. You can simply keep the aluminium frames and order replacement fabric graphics. Setting up these displays, as mentioned earlier, is truly a breeze. It will not take you more than five to ten minutes per presentation board. Here is how you do it for each piece. For the pop-up walls, just pull at the aluminium frame until it expands to its full size. Then you attach the fabric panel and secure it using the magnetic strips on both the frame and the panel. Install the optional halogen lights on top of the frame. For the pull-up banner stands, expand the supporting aluminium pole, lock its joints, and then stick it into the base of the banner stand. Then you pull the fabric banner upward from its slot on the base and attach it to the top of the supporting pole with the use of a hook. If you’re using halogen lights as spotlight for the banner, you place them on the top of the pole, too. For the display counter, simply pull the graphic wrap over it until the wrap covers the entire body of the counter. Then you put the wooden countertop on it. This fabric display board set is truly the best presentation board system you’ll find in the market today. It is a wise investment that will give you a lot of returns in the end. We deliver our boards to any place in Australia – Sydney, Melbourne, Adelaide, Brisbane, Canberra, Darwin, Gold Coast and Perth. Get in touch with us right now so you can learn more information on this product.